Buffalo is the second most populated city in the State of New York and its position on Lake Erie and at the head of the Niagara River make it a tourist destination for many people. Over one in every ten residents is over the age of 65 and many more are rapidly approaching the age of retirement. This is why the Buffalo nursing home abuse & neglect attorneys of Nursing Home Law Center LLC remain vigilant about defending the rights of those who have been injured due to negligent care or horrendous abuse. We’ve provided the following information to help you make more informed choices concerning the type of nursing facility you choose to entrust with your loved ones’ care. Medicare routinely gathers data on every nursing facility in Buffalo, New York based on information collected through inspections, surveys and investigations. Currently, the federally-monitored database shows that inspectors found serious violations and deficiencies at fourteen (35%) of the forty Buffalo nursing homes that resulted in preventable harm. Was your loved one injured, mistreated, abused, or died unexpectedly from neglect while living in a nursing home in New York? If so, we invite you to contact the Buffalo nursing home abuse & neglect attorneys at Nursing Home Law Center (800-926-7565) today to schedule a free case review to discuss a financial compensation claim. According to census data from 2010, the city of Buffalo is home to over 261,000 people and over 11% of its population is comprised of senior citizens. This should not be surprising when considering its scenic location on Lake Erie and the Niagara River which both make it a wonderful place to spend one’s golden years. Its economy is fed by the financial services, technology, biomedical and education industries. Our Buffalo nursing injury lawyers believe in prevention as the primary strategy for enacting change in an industry that is currently experiencing epidemic levels of abuse. This is why we have compiled the following information on the five worst rated nursing facilities in your area and are available to help you choose the right nursing facility to move your loved one to if he or she is being mistreated. For the same type of data on any nursing home you are considering and those not on this list, you can use the Medicare Nursing Home Compare tool located at https://www.medicare.gov/nursinghomecompare. Primary concerns: For profit corporations have been taking over the nursing care industry over the last 15 years, and one of the ways they keep costs down is to eliminate any staff members they don’t deem necessary. Depleted staff levels are often the root cause for poor quality of care; and this facility’s 2 star staff quality rating may have something to do with a horrendous health inspection record. Residents at this facility may be more likely to contract infections or be injured due to environmental hazards. Primary concerns: This facility failed to receive more than two stars in any specific category and its health inspection rating is abhorrent. Understaffing, a lack of quality measures and environmental hazards make this nursing facility one you should avoid when searching for a nursing home to care for your loved one. Primary concerns: This facility is owned by the same corporation that owns Emerald South, so it shouldn’t be a surprise at all that it has received similar ratings. Its staff is rated even lower than its sister facility and its health inspection history is riddled with deficiencies. If this home does not make significant changes, it may also lose access to government funding from Medicare and Medicaid. Primary concerns: There is no staff quality data available for this facility, but we don’t expect it to be good with an overall rating of only a single star. The nursing home has been cited for numerous health and safety deficiencies, placing residents at greater risk of contracting communicable illnesses or being injured due to clutter or environmental hazards. Patients depending on Medicaid as a source of payment will find that these payments are not accepted at this facility. Primary concerns: This facility has a staff quality rating of three stars— considered “average” by Medicare standards. It has poor quality measures in place, however, and similar health and safety problems as the others. It is also owned by a corporation that runs multiple facilities that have similar issues in neighboring suburbs. One of the other ways our Buffalo nursing injury lawyers continue to protect the rights of the many patients who have been mistreated is to educate the public on the many types of nursing home abuse or neglect. Many patients with valid claims never come forward because they are uncertain whether what has happened to their loved ones can be classified as negligence. If your loved one has experienced any of the following, we may be able to help you. Hospitalization due to medication errors. Fractures suffered by a fall experienced due to a lack of supervision. The development of bedsores or advancement of existing sores to later stages. Nursing Home Law Center LLC is a national personal injury law firm that has helped countless clients recover the compensation they were entitled to following injuries. 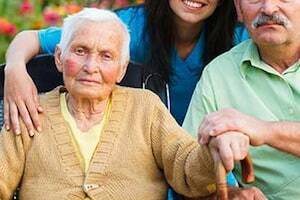 Our award winning Buffalo nursing home abuse attorneys will investigate your claim for free if you feel that your loved one has been mistreated, neglected or abused. Contact us today to arrange your free consultation so that we can gather the information we need to get to work on your behalf. If we are unable to collect compensation on your behalf, you are assured that our time and advice will not cost you a thing.